Show Quality Bettas available for order. Stocklist is updated every now and then. Special Promo for purchasing Bettas. Buy three and get one free (male betta pictured above). No code required. Available until quantities last. To purchase Bettas, please visit this page. Selection is at the lower portion of the page. Keeping indian almond leaves in a Betta aquarium can lower ph levels and remove heavy metal content. 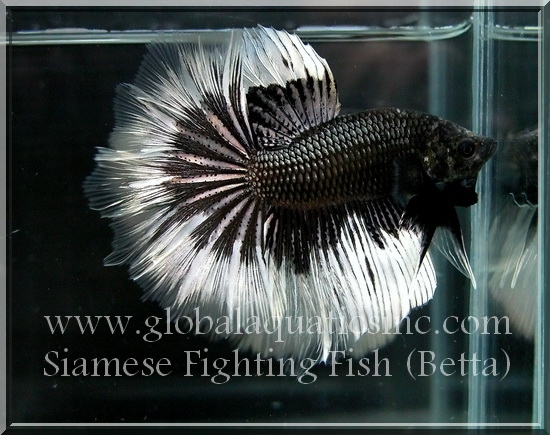 It has been used by Betta breeders in Thailand for many years. Hobbyist use it for conditioning before breeding and for scale hardening. The leaves can also be used to treat bacteria infection and help the Bettas recover from injuries. Some people have used it to increase breeding frequency. Assuming an average 6-10" (15.2-25.4cm) long leaf, you use one quarter of this for every 4L (1.1 US G.) litres for Bettas or 1-2 leaves per 50L (13.2 US G.) for other species. Leave them in the tank for around 15 days in a filter bag or let them lie loose, they will sink after 2-3 days. Expect the water to tint slightly brown with the tannins. Dislaimer: All products included are exclusively available in Betta orders. Indian almond leaf, fish food and brochure are not for sale.